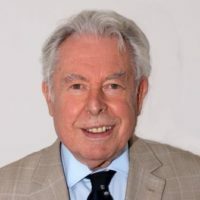 Born in 1933 he became a solicitor and practiced in Cardiff Docks in a general practice covering commercial and private work in property amongst others becoming senior partner leading with mergers with other firms. He was a City Councillor for 24 years and was Lord Mayor of Cardiff 1985/86 which involved presiding at meetings (often rumbustious) and needing firm but tactful control. He was Deputy Chairman of the Education Committee and Chairman of the City Youth Committee as well as Governor of many schools. He was Chairman for Wales of the Duke of Edinburgh Award for 16 years and became and still is President of it. He has a deep knowledge of the needs of young people and their leadership. In 1989 he was appointed Prior for Wales of the Order of St John, in effect the Chairman of its Trustees and responsible for the administration of St John Ambulance Centres throughout Wales including training young cadets and adults in First Aid, the organising of Patient Transfer with NHS and overall responsibility for its finances including fund raising for it (and for the Eye Hospital in Jerusalem) with a turnover of over £1 million each year. As President/Chairman/Patron of many charities, as well as his time as Lord Lieutenant of South Glamorgan (1990-2006) he has contacts with National & Local Governments and many individuals who might contribute as donors to the Insole Court Appeal.